The Concentrated Portfolio continues to outperform. Two new names were added. July was a great month for the portfolio. I have been busy since my last update (with my real job) in June and just wanted to get an update out on the Concentrated Portfolio for July and August. Despite a little bit of market difficulty in August, the Concentrated Portfolio performed admirably. I also took the opportunity to initiate two new positions in Red Hat (NYSE:RHT) and MercadoLibre (NASDAQ:MELI) at nice entry points. I am a particular admirer of the free cash flow yield (c. 5% at entry point), recurring revenue (limits downside) and growth prospects (good upside) of Red Hat. It’s very much a comfort zone investment for me. MercadoLibre is outside my comfort zone but exposes the portfolio to potentially a very lucrative growth vector - the Amazonification of South America. Red Hat did not remain a good deal for long. I should have bought more. MercadoLibre was a good deal for most of August but has moved back up again towards the $290 mark. So the Concentrated Portfolio consists of just seven stocks. Market-beating alpha is sought via high conviction selections on a small pool of winners. The Concentrated Portfolio is really an attempt to try and make sure that I have far more winning stocks than losing stocks in my portfolio. I believe that diversity results in too much exposure to losing stocks that wipes out all alpha performance and leaves the investor with the beta returns of the ETF world. The five original positions of the Concentrated Portfolio are Microsoft (NASDAQ:MSFT), Amazon (NASDAQ:AMZN), Celgene (NASDAQ:CELG), PayPal (NASDAQ:PYPL) and Unilever (NYSE:UN). Positions were started in Dec. 2016 but performance is measured from January 1, 2017. Two new positions were started in Red Hat at the end of June and MercadoLibre in August. The YTD development of portfolio weightings is as follows. As you can see, the exposure to Red Hat and MercadoLibre is not too meaningful. I plan to build up these positions. Red Hat reports next week which could provide a catalyst for movement in either direction. The Concentrated portfolio is not a subsection of another portfolio. It’s my non-retirement investment portfolio and is funded by post-tax savings. Please note that I do have a retirement portfolio in a tax deferred account. I am currently re-focusing the portfolio on about 10 stocks and hope to start reporting on it in October. The Concentrated Portfolio has outperformed the S&P 500 and NASDAQ. It is up 30% YTD (Aug. 31st) on its cost basis to market value vs. 7.9% for the S&P 500 and 18.5% for the NASDAQ. Strong quarterly earnings reports in July resulted in excellent price action. Of particular note: MSFT +5.47%, CELG +4.27%, UN +5.25%, and PYPL +9.9%. Despite some big tech names suffering in August (in particular Google (NASDAQ:GOOG) (NASDAQ:GOOGL)), most of the picks of the Concentrated Portfolio put in solid gains. PYPL made another big move forward at 5.35% and Red Hat jumped 8.73%. The move in Red Hat was bittersweet as I would have liked to have added more to this name. My consolation was MercadoLibre which had fallen significantly in August to sub $250. I am very lucky to have picked Unilever as a "safe" stock. I don’t expect Unilever to repeat this type of performance again but neither do I expect it to fall off a cliff. I will probably hold it in order to lock in my IRRs on a five-year horizon. I tend to chose stocks with an attractive mix of FCF yield and growth. 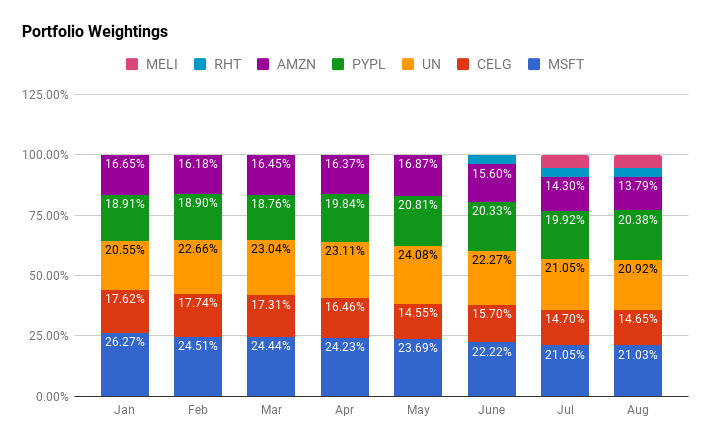 AMZN, CELG and MELI are pricey but growing like crazy. They are bit outside my comfort zone. But PYPL, MSFT, UN and RHT were all solid picks on a fundamental basis when I purchased them. All stocks are large cap and well covered by analysts. I have cash on the side to buy dips. All stocks (even Unilever judging by its recent acquisitions) are disruptors with good growth prospects over the long term. All stocks generate operating cash flows that they re-invest back into the business because they are chasing great opportunities. Disclosure: I am/we are long CELG, MSFT, RHT, MELI, AMZN, PYPL. I wrote this article myself, and it expresses my own opinions. I am not receiving compensation for it (other than from Seeking Alpha). I have no business relationship with any company whose stock is mentioned in this article.